It's day two of the #31DC2013 and the theme is orange nails. I had a hard time getting inspired by this particular prompt! I tried pulling out some orange shades to see if staring at them would help me come up with an idea... Unfortunately, it didn't. So off I went to my Instagram "Photos you've liked" page to see if anything there inspired me. Luckily, this tactic yielded better results than my first one. 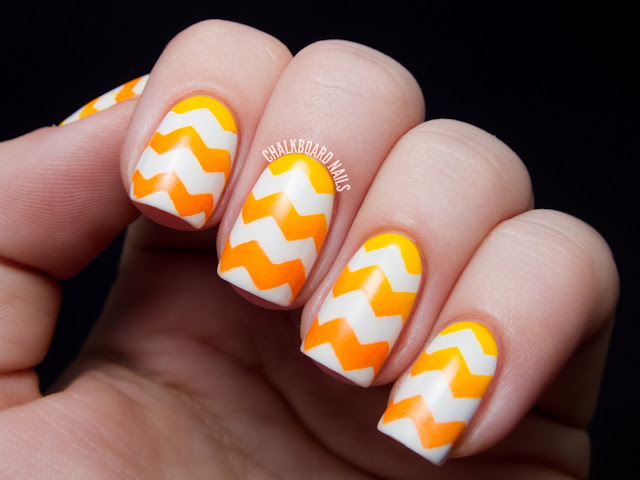 I saw a beautiful gradient chevron manicure tutorial by Storm and Stars and knew I just had to give it a go. For my version, I used Essie Blanc as the white base, China Glaze Sun Worshipper as the lighter orange, and Orly Melt Your Popsicle as the darker shade. Ultimately, this is a tape manicure, so you will need zigzag craft scissors or pinking shears to cut the tape. I checked out the craft scissors at Michael's first, but wasn't really impressed. They seemed pretty dull! So I moved on to the sewing section and picked up some pinking shears from Loops & Threads. They're a little more expensive than the craft scissors but they are super sharp and worked great. Don't forget to use a coupon! The original tutorial uses scotch tape, but I opted to use painter's tape myself. Be sure to stick it to wax paper while you are cutting it -- it makes the tape much easier to work with. I applied the cut pieces to my nails and then sponged a gradient over the top of them. A few minutes of cleanup and I was finished! I'm super crazy about how well these tape chevrons turned out, and I'm glad I invested in the more expensive shears. I know I will be using them a lot in the future! Again, for more details on how to achieve this look, visit Storm and Stars' tutorial. My orange nails from 2012! My orange nails from 2011! Ooooh I really love these! For some reason they make me think of orange juice, haha! Haha they made me think of creamsicles and eggs! Those are really awesome tips for using tape - thanks! I'm not usually super successful with tape, so I shy away from it, even though I've wanted to try it on chevrons for a while now. stunning. this is a great look for a fun party on the beach. I really like it! 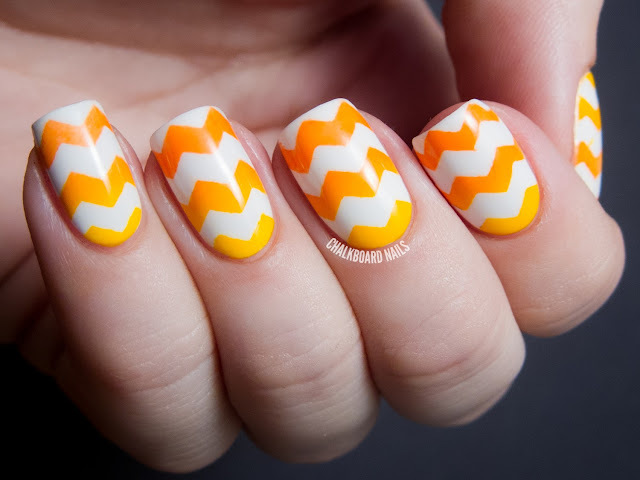 Do you think that painters tape is the best for tape nail art? I find painter's tape is best anytime you need to get the tape into shapes other than straight. I think it holds up better to the cuts/punches! I do think it is harder to get a solid seal on the edges though, so you have to work a little harder to get clean lines when removing. This is really nice, have to try it! This looks amazing! I'm hesitant about orange because of my skin tone but with the white this looks really classy while still being bright and fun! This is sooooo awesome! 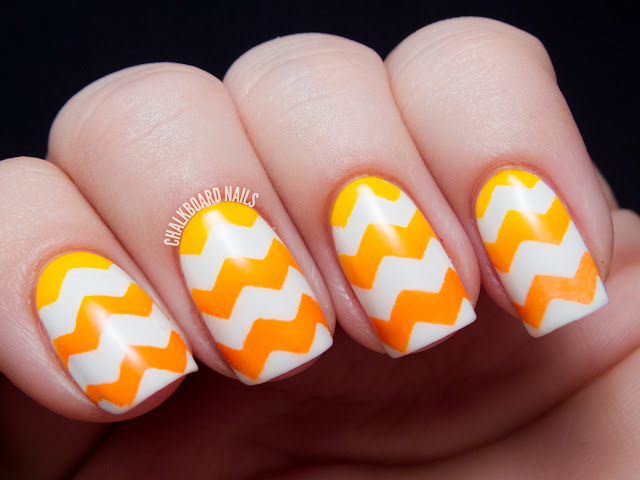 I did a chevron design for one of my orange nails, too. Love the challenge! The top (first) photo is showing up with a bit more glossy shine then your photos usually have - I LOVE it!!!!! Great design - simple - classic - well done - just the right thing to do with orange...orange can be tricky and end up looking like Halloween...this is anything but that! This is so great! Storm and Stars does such great manicures, and your version is beautiful! this might be my favorite look you've EVER done. so classy and funky! I'm obsessed about them too! The gradient turned out so well, and you chose the most perfect shades of orange for it. Great work!